4100 GAP 4OZ POPCORN Size: 4 Oz. Features: -Case of 24 portion packs. -Easy storage. -Pouch is pre measured for ideal results, no measuring cups and a user friendly pouch. -No mess, no loose ingredients to spill and no dirty measuring cups to clean. -Maintain consistency and quality. -No waste, eliminate waste from spills, over portioning or diminished quality and freshness. Material: -Popcorn. Country of Manufacture: -United States. Dimensions: Size 12 oz - Overall Height - Top to Bottom: -5.75". Size 12 oz - Overall Width - Side to Side: -16". Size 12 oz - Overall Depth - Front to Back: -13.5". Size 2.5 oz - Overall Height - Top to Bottom: -3.25". Size 2.5 oz - Overall Width - Side to Side: -14". Size 2.5 oz - Overall Depth - Front to Back: -13". Size 4 oz - Overall Height - Top to Bottom: -4.5". Size 4 oz - Overall Width - Side to Side: -14.5". Size 4 oz - Overall Depth - Front to Back: -13". Size 6 oz - Overall Height - Top to Bottom: -4.5". Size 6 oz - Overall Width - Side to Side: -14.5". Size 6 oz - Overall Depth - Front to Back: -13". 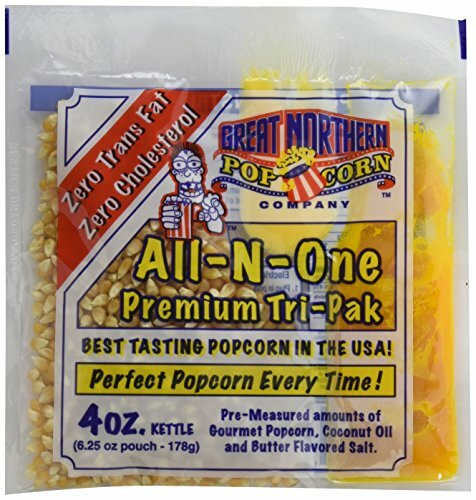 If you have any questions about this product by Great Northern Popcorn Company, contact us by completing and submitting the form below. If you are looking for a specif part number, please include it with your message.